The EL042 is an alarm and relay unit for the EnviroMon data logging system. 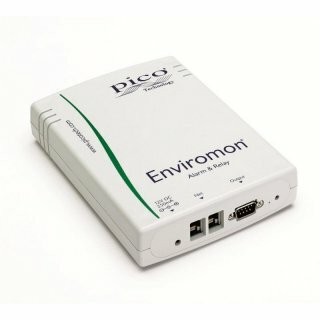 When the EL042 detects an alarm condition, it can activate its built-in sounder, send a message by activating an external telephone dialer, or trigger up to three user-supplied alarm devices connected to its opto-isolated outputs. The EL042 can be powered from the EnviroMon network or an external 12 volt power supply. The unit includes a rechargeable backup battery that allows the EL042 to maintains its alarm outputs for several hours in the event of a power failure. Using the EL042 you can enable the ?deviation alarm? feature in the EnviroMon software. With this advanced feature you can set up the EnviroMon system to monitor a number of channels as a group. Your EL042 can then activate an alarm if any channel differs from the group average, or from any other channel in the group, or from the median of the group, by more than a specified amount. You can even define nested groups of sensors.